GETTING into the inner sanctum at the Tsukiji fish markets is rather like getting an invitation to the Queens garden party, no easy task. It’s all about who you know. The fish market is on most people’s must-see Tokyo list and most have to queue from as early as 1am for chance to be one of 60 people let in to watch the frozen fish auctions from behind a barrier after a two-to-three hour wait in a freezing holding room. We on the other hand are supplied with our own pair of shiny white wellies and driven from our hotel in Ginza to the market at the relatively civilised hour of 4.45am for a 5am start to be swept straight through to witness the fresh fish auction, which is the real inner sanctum of the world’s biggest market. This is where the reputation of the greatest chefs in Japan are made or lost, those Michelin stars (and there are more Michelin-starred restaurants in Tokyo than New York) rely on the quality of the fish. And when you consider that one fresh tuna can go for up to $US40,000 (with the first catch of the year nearer $US I million) those silvery tuna start to look more valuable than platinum. Certainly it becomes clear we’re talking the kind of money you are more likely to see exchange hands at Sotherby’s than at your local fish monger. No wonder fishermen call Bluefin (maguro) 'black diamonds’. Our entre into the market comes via the exceptional contacts of Naomi Mano, CEO of Luxurique concierge services and her friendship with Yousuke Imada, the owner of Kyubey Ginza - one of the best sushi establishments in Tokyo. 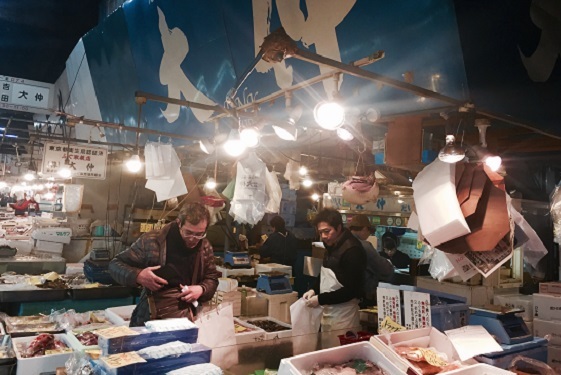 His market contact is one of the most powerful fish wholesalers in japan. So there’s a lot of bowing to be done to the various people who have smoothed our path. We follow out guides into the murky depths of the market jumping out of the way of the early morning motorised carts that zip through narrow alleys changing direction in an instant like schools of darting yellow fish. In the auction room the fresh tuna laid out on wooden slaps are examined with forensic precision. Buyers are looking for a certain degree of fat and texture that makes for the most melt-in-the-mouth sashimi. Wooden carts stand ready to whip the fish away for filleting as soon as the bidding is done –freshness is everything. The calling card of those allowed to bid is a baseball cap emblazoned with a company name and number, a secret sign language of fingers means bids rise quickly into the thousands. Over at the frozen fish auctions it’s a noisier affair with auctioneers doing their own kind of rap song and dance to whip waiting buyers into a frenzy. Not understanding a word probably makes it more entertaining. Once the bidding is over we head back through the labyrinth to wholesaler’s stall where the fish from that day is being cut into portions. This requires a knife almost as long and sharp as a Samurai sword and a wealth of experience, at 30,000 yen ($US 2634) a kilo you wouldn’t want to make a mistake. No visit to Tsukiji is complete without a sushi breakfast. There are plenty of sushi counters here in the restaurant area just inside the main gate off Shin-ohashi Street. However we are going one better –we’re about to taste the freshest tuna we’ll ever eat, sliced from this morning’s fish. It is petal-pink with a delicate taste that explodes in the mouth with unexpected depths of flavour. We discuss the various merits of different cuts of fish at length, sampling and savouring – “Now you are beginning to think like the Japanese”. Says Naomi. The market is slated for closure to make way for a highway to be put in for the 2020 Olympics. The new venue is across the river in Toyosu although the move is currently on hold due to contamination issues with the new site. Nevertheless, go while you can before this slice of Tokyo life disappears. Having an auspicious start to the year is important, so, if you're the owner of a big sushi restaurant, starting the year with a prized fish is the way to go. Restaurateur Kiyoshi Kimura, has prevailed in the last 7 new year auctions, This year he spent over $US614,000 for a 212-kilogram bluefin tuna. In 2013, a bidding war drove Kimura's winning bid to ¥154.4 million about $US1.4 million at today’s rates) for a 222-kilogram fish.